In today's job market, it's not uncommon to submit applications for many positions. That involves lots of time, and lots to keep track of. You don't want to squander those precious hours by missing important application deadlines, garbling companies and positions, confusing interview times, or forgetting to follow up. Accordingly, properly managing your job search is just as important as identifying job opportunities and submitting your application. Here are the top ten ways to keep track of your job applications and stay on top of the job search process. If you're familiar with Microsoft Excel or a similar program, creating a spreadsheet is a simple and effective way to keep track of your job applications. Company Name - The name of the organization you're applying to. Contact - Your point of contact at the company; probably who you addressed your cover letter to, such as a Director of Human Resources or Office Manager. Email - The email of your point of contact, or, if preferred, a phone number. Date Applied - When you submitted your application. Application Summary - What you submitted: a cover letter, resume, and any additional materials, like a portfolio or reference list. Interview - When your interview is scheduled. Follow-Up - Did you send a thank you email or letter? If so, indicate here. Status - If you were rejected, offered the job, asked in for a second interview, etc. If Excel isn't quite your cup of tea, don't fret. You can create a simple table in Microsoft Word or a similar word processor. Just insert a table and choose the number of columns based on how many categories you want to keep track of (company name, contact information, date applied, and so on) and the number of rows relative to how many positions you're applying for. Company information, like its location, number of employees, size, recent developments, etc. If you like to stay organized online, Google is a great way to go. If you have a Gmail account, you can use Google Drive, through which you can create, save and export spreadsheets, in addition to written documents, like your cover letter and resume. You can also link up with Google calendar to make sure you stay on top of important dates. "In my job search I didn't think I'd need a job search organizational tool, but as my job search went on, and I continued to network and apply for jobs, the need for a tool like JibberJobber grew exponentially - because the amount of data I was collecting grew exponentially! It's easy to get buried under the data and miss follow-up opportunities (or, like in my case, appointments)!" If you spend more time on your phone or tablet than you do on your computer, consider using a mobile app to organize your job search. Here's a list of job search management apps available for smartphones. You can download a variety of job search organization widgets - from e-mail alerts to browser installations to blog and website features - that will help you stay on top of your job search. Just be sure that you don't get overwhelmed, as you don't want to have to organize your job search organization tools. 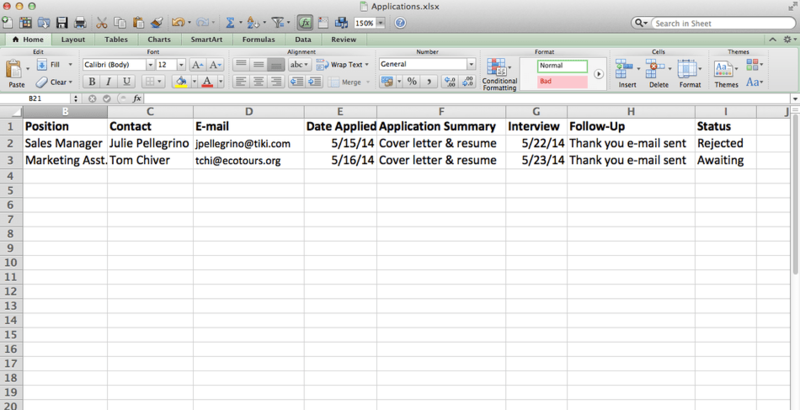 Identify your needs and priorities (Do you want to keep track of positions you're interested in applying to? Manage submitted applications? Get alerts about new openings, deadlines, or interview dates?) and go from there. Many job search sites like Monster, CareerBuilder and LinkedIn offer built-in tools to keep track of your applications. Although the downfall to using a site-specific method is that you may have to keep track of various lists on different sites, if you have a favorite job search site you're sticking to, it's not a bad option. For a do-it-yourself method of organization, consider using your smart phone "as is" - for example, use your notes or download a spreadsheet app and keep track of your information there. You can also use alarms, alerts and your calendar to stay on top of impending deadlines, interviews, and other important dates and times. If you're a pen-in-hand type who likes to keep it old school, buy a notebook and dedicate it to your job search. In addition to keeping track of your application, you can also use it to jot down a cover letter draft, take notes during interviews, and record anything else that comes up while you're looking for jobs, networking, and interviewing.